Mary Elizabeth Jonas was born on 31st Avenue in Omaha, Nebraska in 1910. Her father, August Fredrick Jonas, the son of German merchant class immigrants, had come from Milwaukee. Her mother, Jessica Stebbins, was A. F. Jonas’ second wife, and was descended from settlers in Colorado. Mary Elizabeth’s father was nearly 60 when she was born and already in stately semi-retirement with a position as Chief Surgeon at the Union Pacific Railroad. He was a great collector, buying Egyptian antiquities, articles of natural history, and many paintings including the works of Winslow Homer, Albert Bierstadt, Ralph Blakelock, and George Inness. Mary Elizabeth’s recollections of her father include accompanying the family driver’s daily trip to the Union Pacific offices in downtown Omaha to retrieve her father from work. They did not speak after he lit his cigar. Her brothers August and Carl became a surgeon and writer respectively. By her own account, Mary Elizabeth was precocious. Her resume says she started school at five, “skipping kindergarten.” She attended public school in Omaha where she received no more artistic education than the art classes that were a part of the standard curriculum. Very little work survives from this early period except a pencil sketch of the family retreat in Madison, Wisconsin done at the age of seven. While attending Smith College in Northampton, Massachusetts from 1927 to 1931, she took no studio courses until her senior year when she studied with Gregory d’Alessio. Yet several fine pencil portraits emerge from this period. Naturalistic and not always flattering, classmates and instructors are rendered from life with skill and insight. Upon graduation she embarked on the Grand Tour with her mother. They crossed the Atlantic on the Queen Elizabeth and toured the Mediterranean including visits to Gibraltar, Athens, “The Holy Land,” and a three-week tour of Egypt. A watercolor sketch of the artist’s mother reclining comes from this trip. Precise drawing and luminescent washes of color make this a most remarkable piece. While in Luxor, Jonas contracted Typhoid fever. The symptoms did not manifest themselves until she was aboard the steamer Columbus headed for America. On orders from the ship’s doctor, she was put ashore on the island of Malta and transferred to the Hospital of the Little Sisters of the Company of Mary in Sliema. She stayed ten weeks and lost 30 pounds. The linen-covered sketch book she kept while there gives insight into her untutored talent and artistic vision. She stares out at us from her hand-held mirror examining her gaunt features and revealing a dawning awareness of returned health. Her breakfast things are sketched and catalogued as she would on many occasions during her travels. The calm repose of the nuns is rendered in brilliant washes of color. She poses herself glamorously in evening clothes against a background of persimmon. After regaining her health, M. E. Jonas returned directly to New York to continue her studies at The Art Students League with her former instructor at Smith, Gregory d’Alessio. She subsequently studied with Robert McNulty, Kenneth Hays Miller, and Reginald Marsh. Self-expression was then not as important as the fundamentals of drawing for a young artist and she applied herself to life drawing classes while learning the fine points of watercolor and oil painting. From this time, we have dozens of notebooks recording life in New York City during the early 1930s. An intense exercise in observation produces a study in fashion and manners in a world of women in gloves, men in hats, and waiters with serviettes on their arms. These cannot be viewed without imagining a young woman who has come to the theater or cafe not to see a play or have a cup of tea but to observe others having those pleasures. The sense of separation from the flow of life that is visible in this work is a critical part of the artist’s sensibility: a stance resignedly or occasionally heroically apart, a position of detached, but privileged observer. This would be of significance in the years 1935 and 1936 when she studied in the studio of George Grosz. A German refugee and a scathing critic of the inequities in American society, Grosz was a model of the artistic imperative to imbue art with social commentary. His ink and watercolor sketches of the affluent and the impoverished in American urban life were extremely influential in the young artist’s work. Yet Mary Elizabeth was, by birth, something more like the very thing Grosz lashed out in his work. She lived in a proper boarding house for young ladies on East 62nd Street run by Mrs. Outerbridge Horsey, summered in Omaha and Madison, and dated an heir to The New York Times publishing empire. This play between artist and conventional member of society would characterize her life’s work. The year 1935 might represent something of a turning point for the artist. Something seems to have created a sense of disenchantment with her life in New York, either artistic or, more likely, romantic. She returned to Omaha and embraced her life of privilege with something like a passion. Her introduction to Harold Gifford was as inevitable as its success was improbable: his father was also one of the town’s great men of medicine. On calling, he was told by the brash young artist that she did not like men who smoked pipes, parted their hair in the middle, or wore mustaches. He returned the next day chastened, shaved, and morally improved. Convinced he was a man willing to make the necessary sacrifices, Mary Elizabeth agreed to his proposal of marriage in 1936. Thus ensued a comfortable and productive life of child rearing, home making, and travel. The inclination to view M. E. Gifford as an amateur is tempting but not necessary in view of her constant, daily, artistic activity. The opportunity to produce theatrical sets, costumes, posters, and murals, while continuing to sketch and paint was met with an obsessiveness that is incontrovertibly artistic in nature. The determination to bring her artistic vision to every part of the activity that her circumstances permitted defines an artist of scope and depth. Yet there is clearly the tension between the colliding worlds of art and society, New York and Omaha, that is clearly seen in the self-portrait with iced tea and cigarette. 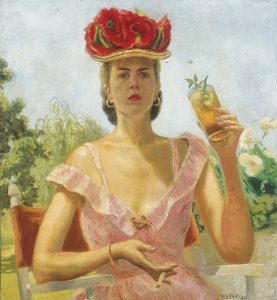 The revealing dress, the insistent cigarette, the tea about to spill, and the costume hat all lend an agitation to a scene that otherwise seems to represent a moment of leisure in the garden at high noon. It is very unlikely that she had seen the work of Frida Kahlo but the penetrating self-examination and the almost religious use of cultural symbols suggests a shared vision of women both vulnerable and powerful, fixed in their milieu by both artifact and sensuality. The following 20 years saw the artist making art from her life. In over 135 theatrical productions, she provided set and costume design as well as construction. In this work she demonstrates the ability to execute as well as conceive the realization of complicated animal costumes, full-stage painted flats, and silk-screened posters. In her home she made Christmas cards, centerpieces, and decorative mosaics. Her travels are documented in sketchbooks that record in exhaustive detail the places and people visited as well as the apparently tender relationship she experienced with her husband. In the mid 1960s, Gifford brought a new dimension to her sketches when she began modeling in plasticene the plump forms of middle aged men and women. These figures gained substance when produced in polyester resin and painted with glossy epoxy colors. The small sculptures, some busts, others more iconic full figure sculptures, can be viewed as totemic for the artist. She appeared to fight the onset of the bland and asexual world she saw around her by embracing its image in an affectionate but cautionary way. These works were no longer in the service of the artist’s societal or familial obligations. They represent a turning back to the period in her life when she felt most like an artist. There is a direct link between the swelling shapes of the sculptures and the sinuous line and caricature of the sketches made in the theaters and restaurants of New York City 50 years earlier. This allowed Gifford to see herself as the artist she had always been. In 1979 she exhibited and sold her work for the first time. For the better part of half a century, the artist used the gender-neutral M. E. Jonas, then M. E. Gifford to sign her work. In the 1970s, she adopted Emmy Gifford as her artistic identity. The phonic equivalent of her initials and the name used by friends, this change signaled an emergent self-awareness of her unique artistic talent and an assertiveness about her right to proclaim herself an artist. For most of her life, this had not been easy or obvious. It was not a role that a society woman (or any woman for that matter) could easily identify with or practically carry out. It is unfortunate that, as she came by this awareness of artistic purpose, she also began to suffer from the effects of Alzheimer’s disease. She saw one of her great passions, the Emmy Gifford Children’s Theater, grow up and move on to a new name and direction. By the early ‘90s, her studio had fallen silent and the daily activity of art had stopped. Upon her death in 1997, a retrospective in Omaha’s Old Market was organized by the artist’s family and friends to document her life in art. That show and the spirit of wonder and appreciation that underwrote it was the inspiration for The Art of M.E. Gifford exhibition on view at the Museum of Nebraska Art from September 21, 2003 to January 4, 2004. The Museum of Nebraska Art has 36 works by Emmy Gifford including detailed journals of her travels with husband Hal and her family and meticulously executed paper dolls that document the fashions of her time.